Author; father of David Bonan; lived in Tunis at the end of the eighteenth century. 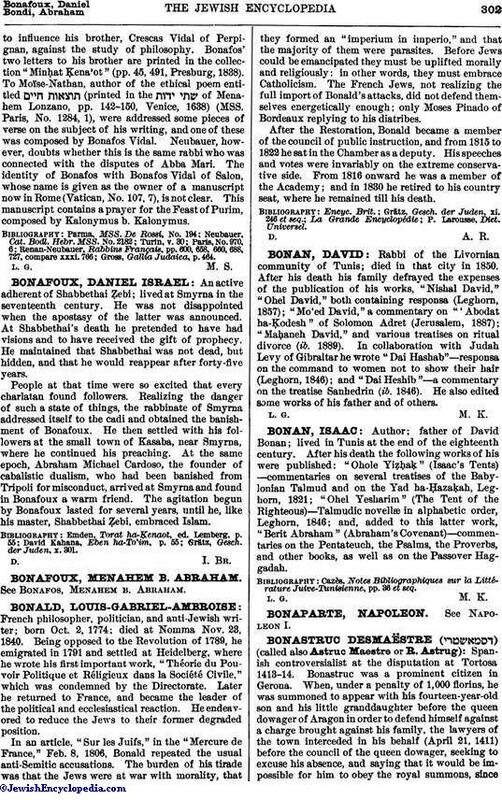 After his death the following works of his were published: "Ohole Yiẓḥaḳ" (Isaac's Tents)—commentaries on several treatises of the Babylonian Talmud and on the Yad ha-Ḥazaḳah, Leghorn, 1821; "Ohel Yesharim" (The Tent of the Righteous)—Talmudic novellæ in alphabetic order, Leghorn, 1846; and, added to this latter work, "Berit Abraham" (Abraham's Covenant)—commentaries on the Pentateuch, the Psalms, the Proverbs, and other books, as well as on the Passover Haggadah. Cazès, Notes Bibliographiques sur la Littérature Juive-Tunisienne, pp. 36 et seq.